Having two teenage kids sometimes drive me insane. Not because of their bad behavior–both of my teenager son and daughter are sweet kids, Alhamdulillah–but because they are reaching puberty. It means, in this phase, they started to learn about love. And when he showed me their texting, there are loving words like: “thank you, sweety.” “I miss you too.” and “I love you.” And reading it, I was like going, “Whaaaaadafuqqq..! !” *ahem, sorry, son! Mom-mom didn’t mean to swear* That’s it. I can’t read further–even though my son allowed me to. And not only that, my son even ask for my advice. Lots and lots of time. “Mom, if she asked me like this, what would be the best answer for me to give?” Such question always left me jaw-dropped. How can I put this right, but….. ah, if only they know! Kids, your mother is never really prepared to see her children grow up. My children are, and will always be, my babies. Anyways, few days ago, my daughter suddenly asked for my advice. She told me that she liked this boy, a sophomore (her senior). She called him “senpai”. It’s a Japanese term for a senior in school or high school. Well, yes, my daughter has a serious interest in Japan culture. And she’s also an otaku, like me. (Note: Otaku means people with obsessive interests, commonly the anime and manga fandom). And this senpai of her also an otaku. So, they kinda “speak the same language”, about anime, manga updates. Okay, so, my daughter likes this senpai, a lot. But he, apparently, didn’t show likewise. And so, she started to see another boy in her class. Oh, btw, my daughter studies animation in a state high school in Jakarta. To understand it better, let me copy the conversation between me and my daughter on whatsapp. And to be honest, she talks English to me. Not Indonesian. It’s her way of practicing English. And I must admit, her English is way better than mine when I was her age. ^_^ Not just that, she also speaks Japanese. She learned it by herself based on the Japanese books (and dictionary) I bought years earlier. Uwinnie (W): Mam. Aku mau curcol. –> means, she wanted to tell something that weighed her heart. W: But it’s about love pls dont kill me..
W: -_- So uhmm. I’m going out with this person in my class. I like him so much I always think about him. I’m really happy with him by my side, my heart beats like crazy when he come near me. So, really, I like him so much. W: And then one day I met senpai at the canteen. I even dreamt about senpai three times in a row, last week… After some week we didn’t contact each other. My heart throbs and it felt like squeezed from the inside, I barely breathe. Like, wtf. Does it mean that I still like senpai or what? I even cried because of senpai because I felt like he betrayed me. Cause he said he doesn’t like this one girl but he always talk about her in twitter. And he knew that I liked him, yet act like nothing happen. Me: Hihihihihi.. Does senpai know about this boy you went out with? Yes of course, it means you still like your senpai. And boys, Uwi, never tell his feelings honestly like girls do. Me: Oh… well, you’re not a real sister of his, so he can always change his mind about it. Well… just don’t take the step like other girls would do. You know, playing around, and try to make senpai jealous. It just won’t work for certain boys. Just be his friend. His imouto. Don’t put your hope too high. Just enjoy the good talks with him. Most boys prefer that. Me: Hahahaha.. galau ni ye.. 😛 —> it’s a friendly mocking for people who got confused with their feelings. Noo.. just enjoy both. Do you really think if you sacrifice your relationship for your senpai, he would accept you? It doesn’t work that way. 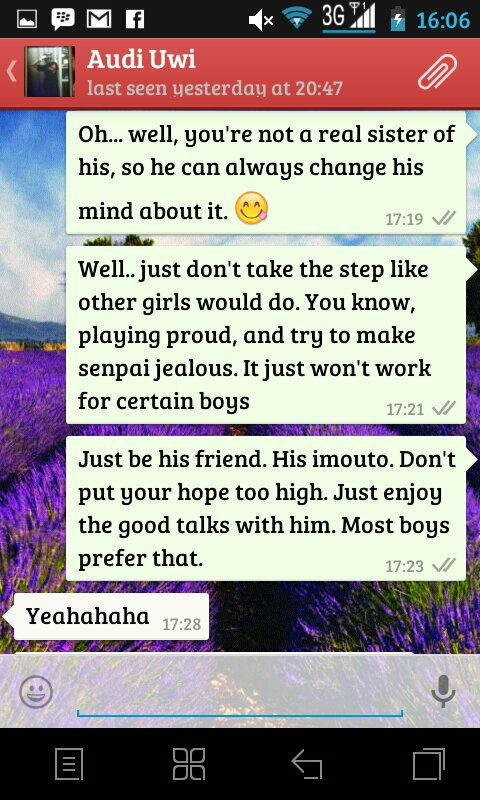 Just enjoy the time with your boyfriend and stay friends with senpai. Just remember what I told you: don’t use your heart too much. Just take it easy. Don’t say “I love you” unless you are very sure about it. “I like you” is enough. 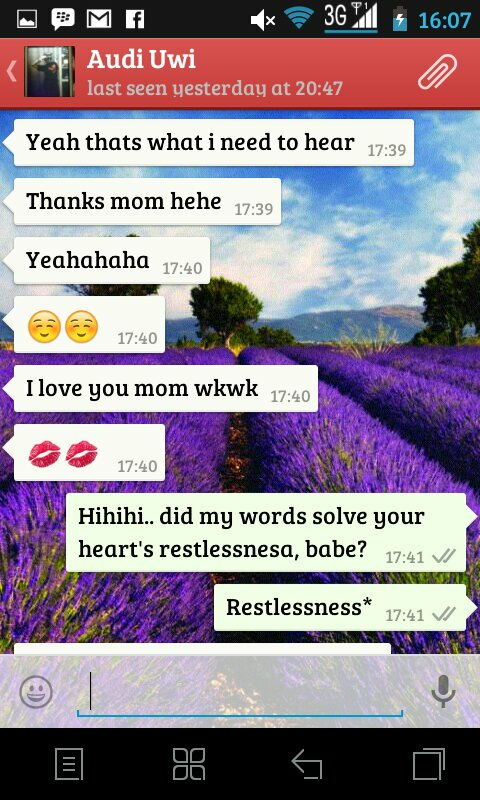 Me: Did my words solve your heart’s restlessness, babe? Me: Hehehe.. Alhamdulillah. Yo wis, don’t forget to pray. Oh, ngga masalah, anakku.. Ini dia pulsanya. Silakan tinggal digosok aja yaa.. Niiih.. terima yaa..